I decided to do another ricotta quinoa bowl because I loved the Crispy Pancetta Quinoa Bowl that I made last week. And, frankly, I still had some ricotta cheese left. And some mint and some peas I’d been dying to use, and an excitement for the spring equinox this weekend. Spring! I can’t believe we can finally say good riddance to winter. Sure, here in Michigan, the ushering in of spring doesn’t necessarily mean the end of winter-like weather. I vividly remember being out on the playground in first grade on the first day of spring with snowflakes flying all around me. But we haven’t had a snowfall here in the Detroit area in weeks now, and all except for the behemoth snow piles have melted, so – I choose to believe that the snow has said sayanora and exclaim, Welcome, Spring! Rinse the quinoa and add with the two cups of water to a medium-sized pot. Bring to a boil, then cover and reduce the heat to medium-low and let simmer for 15 minutes, or until all of the water has been absorbed. 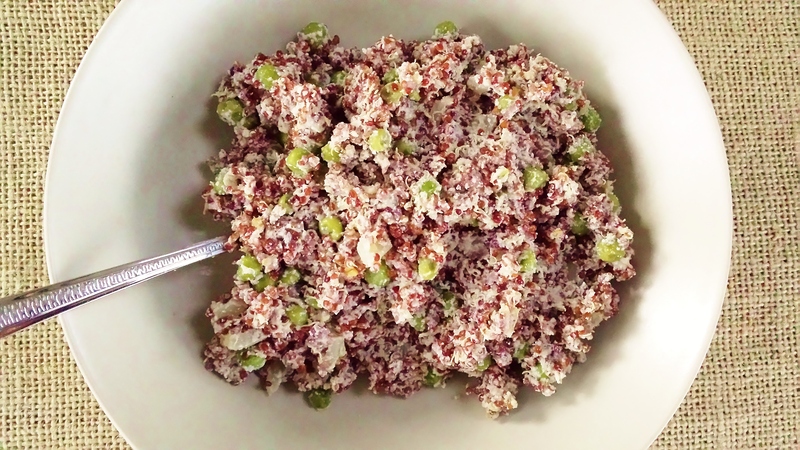 While the quinoa and peas are cooking, add oil and diced onion to a large saucepan on medium heat and sauté for six to seven minutes, stirring frequently, until onions are a nice browned color. Add garlic and cook for another two minutes. Remove from heat until quinoa and peas are done. Once ready, set the pot holding the quinoa on low heat and add in the ricotta cheese, butter, juice from the lemon quarters, peas, diced mint leaves, salt, and pepper until mixed well and warmed through. Add to bowls and enjoy! Makes three good-sized portions.